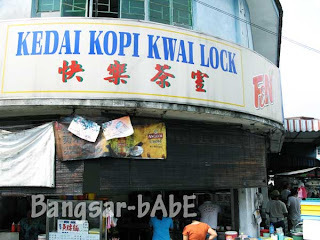 9.30am: Breakfast @ Kedai Kopi Kwai Lock The next morning, we went to Kedai Kopi Kwai Lock at Pulau Tikus for breakfast. Parking can be quite a hassle so go early to avoid the jam and crowd. 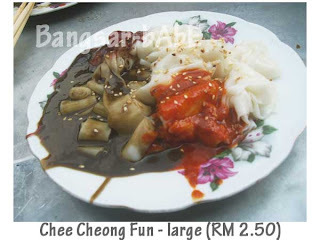 The Chee Cheong Fun is really good. We always have a large plate each whenever we come here for breakfast. Served with har kou (prawn paste) and chili sauce, the rice noodles were silky smooth and lip-smackingly delicious! The Char Kway Teow here is not bad. 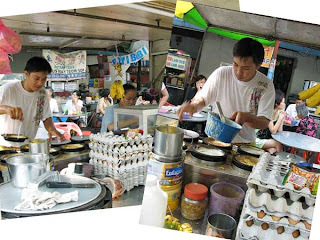 The lady uses duck egg instead of the usual chicken egg which gives the noodles more flavour. The “wok hei” kway teow was fluffy with lots of beansprouts and thinly sliced lap cheong. We order this all the time too. 🙂 rif wanted to try the roti babi as there were quite a few people ordering it. 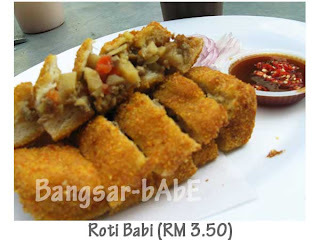 The roti babi here is different from the one in Yut Kee. This version is coated with bread crumbs. The filling was made out of minced pork, diced potatoes and carrots and served with chili and plum sauce. I thought it was average. 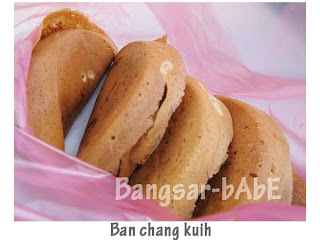 After breakfast, we got some ‘ban chang kuih’ from the van just outside the coffeeshop. 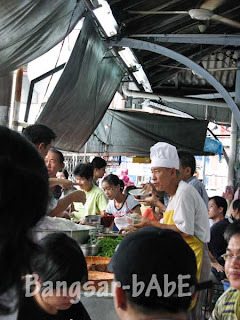 The kuih is made to order and they have many varieties for you to choose. 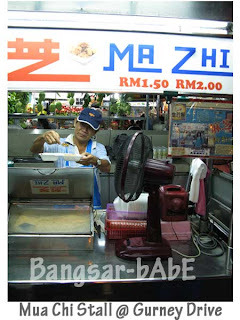 We stuck to the more conventional ones – original(RM 0.70) and corn (RM0.90). After breakfast, we wanted to go to the Kek Lok Si temple. The road to the temple was very jam and there were so many people wanting to go to the temple. We gave up and went shopping at Queensbay Mall instead. 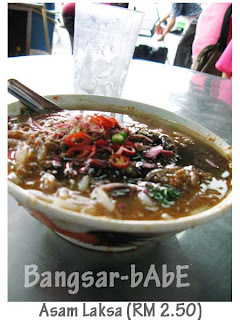 After shopping, we went to Air Itam for Asam Laksa. After the very fulfilling lunch, we went to New World Park for ais kacang. We ordered 2 bowls to cool down from the sweltering afternoon heat. 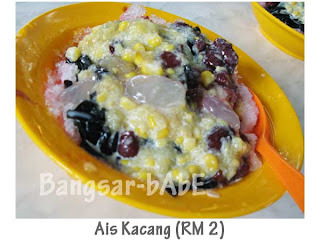 The ais kacang came with red beans, jelly, atap chee, sweet corn and fruits, topped with rose syrup, brown syrup and evaporated milk. 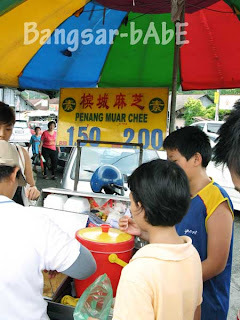 While refreshing, it was just an average, no-frills bowl of ais kacang. Went back to the hotel to rest a while before heading out again for dinner. This time, we decided to have dinner at the Pulau Tikus market. There are quite a lot of stalls operating there. 7.30pm: Dinner @ Pulau Tikus Market rif ordered the Char Kway Teow while I tried the duck kway teow th’ng. We also had a plate of sar hor fun to share. 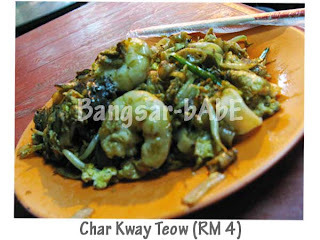 As you can see by now, we have Char Kway Teow ALMOST every meal. 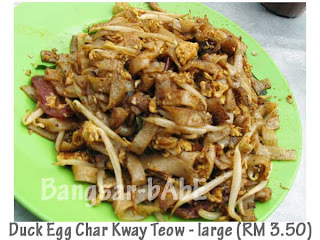 o_0 The Char Kway Teow was decent; but no where as good as Kwai Lock’s duck egg version or Bee Hooi’s CKT. The kway teow th’ng was quite good. It came with pieces of pork lard (yum! ), duck meat, fishballs and coagulated blood (which I didn’t eat :P). I liked the distinct flavour of the broth compared to the clear versions from KL. 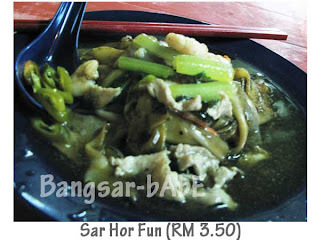 The sar hor fun was alright. Nothing spectacular, the one from Kwai Lock (coming up in Day 3) is still better. After dinner, we went to Gurney Drive again for the fried chicken skin! It’s really addictive but also very bad for health. Kekeke… Ta pau-ed 3 cups of fried chicken skin and 1 cup of sotong again. We also ordered the really soft, melt-in-your-mouth mua chi and oh chien. This time, the oh chien was from the stall across the McTucky Fried Chicken Skin. No pictures of the Oh Chien & Mua Chi. They didn’t look so photogenic in “ta pau” form. We ate all this for supper back at the hotel. dammit. 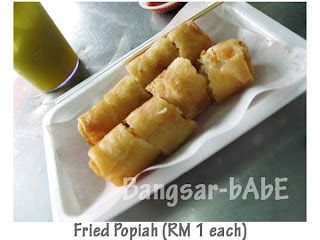 can we make a trip at least to ipoh next time i’m back, penang if we can get a fourth or fifth glutton? ps/ once you get your hands on a bottle of caramelized balsamic, try drizzling it over strawberries and smush the (cut) berries lightly with some fresh mint. is good. THAT WAS DINNER?? WTH?? Go eat something proper pls!!! tsk. did you completely miss the part about the strawberries-balsamic-mint combo being good? i had a can of tuna at 6! However good it is, you’re still not getting enough nutrients from it. i knew we ate a lot… but after reading this post, we really did eat a LOT. 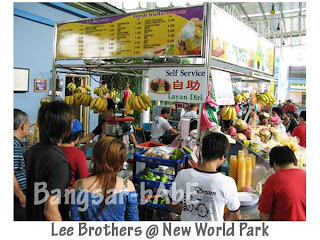 i thought we ta pau-ed rojak from new world park, what happen to the pic’s?